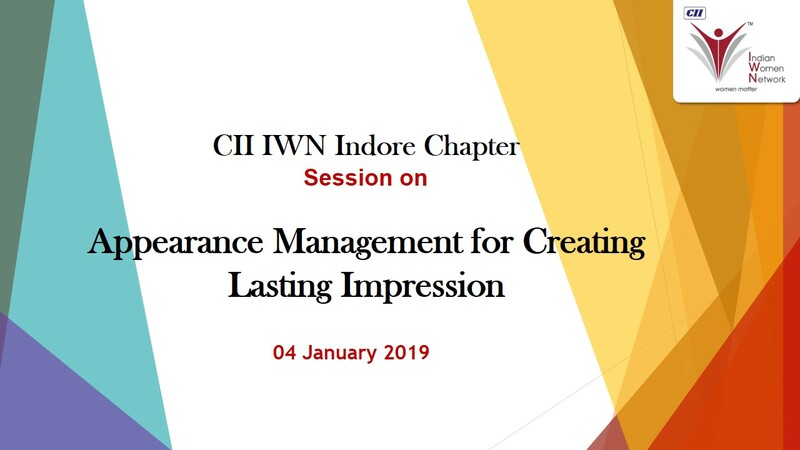 CII’s IWN Indore chapter organized an interactive session on “Appearance management for creating lasting impression”, on 04 January 2019 at Indore. The objective of program was to provide the instinct to the working woman for creating lasting impression at time of projecting professionally. The appearance for woman plays a vital role especially when they are working or professional. During the session, Ms Sisodia briefed about various aspects of appearance & the impact they create on the other person. She discussed about power dressing, self grooming & body language which plays most important role in terms of a person’s appearance. She further discussed about tips and techniques to improve our appearance to create lasting impact. “It is challenge for woman to create their impression to being accepted by others as professional and knowledgeable. You don’t get second chance at the first impression”, said Ms Nupur Singh, Chairwoman, CII’s IWN Indore Chapter. “Appearance also builds self confidence. We at IWN Indore chapter create such session for woman for woman engagement, empowerment and building confidence”, Ms Singh added.